Mid-morning snack, today. 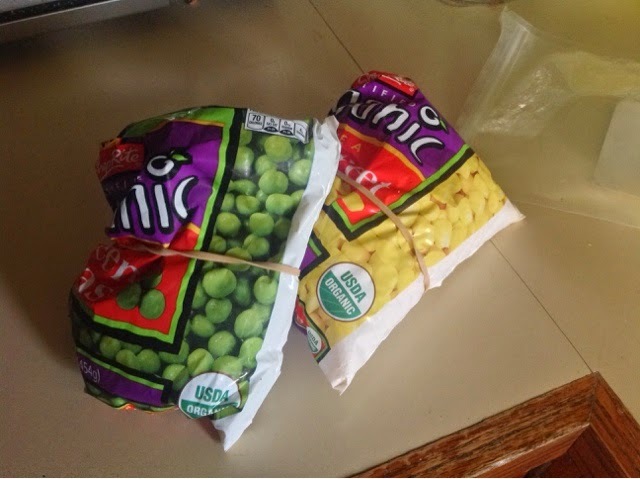 Boiled peas and corn. Frozen vegetables are a great invention, especially for a parent who's just raised herself from a influenza-ridden sickbed to prepare food, nauseating food. Jared's out covering a garden club presentation I was supposed to do. "Momma, your cooking is the best," Beren says as he scooped another heap of peas and corn onto his spoon. "Why, thank you," I say. "When I was a girl, I thought my momma's cooking was the best, too." Toothy, pea-y, corn-y smile. "Why?" "That's just the way it is. Everybody thinks their momma's cooking is the best." Now that dinner is approaching, I think I'm craving my Mom's spaghetti, meatballs, and sausage. How does she make it so good? I think I'm starting to feel a little better. Mom?